The Cardiovascular Imaging Laboratory provides echocardiographic and carotid imaging for approved CRU protocols, as well as measurement of endothelial function and arterial stiffness. Sandy Lima performing a cardiovascular ultrasound. 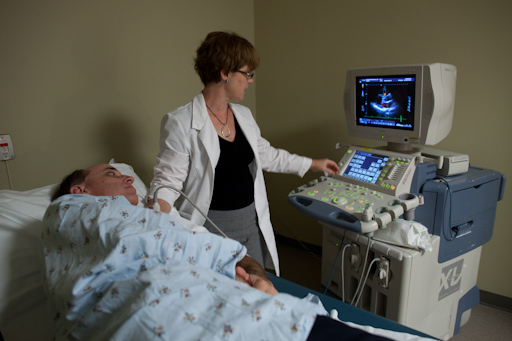 Echocardiograms are performed on a Toshiba Artida ultrasound system. All cardiac studies are stored digitally and analyzed using the Philips Excelera System. Image acquisition and analysis protocols can be customized to meet the unique needs of the investigator. Carotid imaging is performed on a Toshiba Aplio ultrasound system. Using commercially available state of the art equipment that includes automated border detection, the core lab can accurately measure carotid intima-medial thickness and distensibility. Brachial ultrasound studies are performed on a Toshiba Aplio system. A high frequency (15Mhz) ultrasound transducer is held in place by a mounted stationary device to insure reproducibility of brachial reactivity measures. Endothelial function tests are performed using both cuff inflation and nitroglycerin to induce brachial flow mediated dilatation (FMD). Analysis of both brachial diameter and flow velocity is performed using state of the art commercially available equipment with automated edge detection. Vascular Stiffness is measured as the the pulse wave augmentation index (AGI). It is derived from measurement of the pulse wave contour and is a measure of the pressure wave is reflected back during pulse wave cycle, which is a measure of vascular stiffness. AGI can be obtained from the EndoPat and SphygMoCor, each of which measure the radial artery pulse wave.